17 Sauce for Roast Mutton. Take two or three large Onions sliced thin, four or five large spoonfuls of water, two of Vinegar, two of red Wine, one Anchovy washed & minced, a little Pepper & salt. Stew a little in a Sauce pan, & put in the dish, under the meat. Quin's Catsup. Pound fine in a Marble Mortar a quarter of a pound of unwashed anchovies with four cloves of garlic, & a spoonful of Cayenne Pepper. Then mix them well with half a Pint of Walnut, & half a pint of mushroom Catsup. Strain, & put into a bottle with four cloves of garlic. 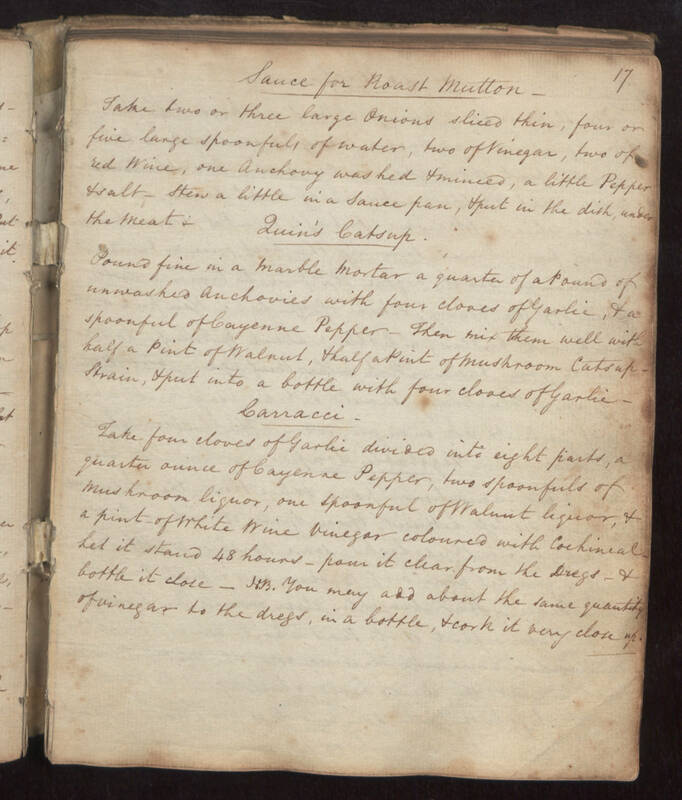 Carracci Take four cloves of garlic divided into eight parts, a quarter ounce of Cayenne Pepper, two spoonfuls of Mushroom liquor, one spoonful of Walnut liquor, & a pint of White Wine Vinegar coloured with Cochineal. Let it stand 48 hours, pour it clear from the dregs, & bottle it close. N.B. You may add about the same quantity of vinegar to the dregs, in a bottle, & cork it very close up.